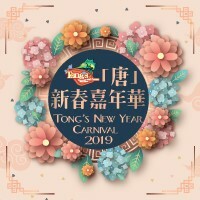 King Parrot Group : News and Offers | Get ready for fun at Tong's Chinese New Year Carnival! Get ready for fun at Tong's Chinese New Year Carnival! Spring Festival is around! Looking for a festive atmosphere? Join Tong’s Chinese New Year Carnival to a scrumptious buffet, exciting game booths, Live Music, handcrafts DIY and kids cooking workshop! Rendezvous with you family and spend a wonderful family day!